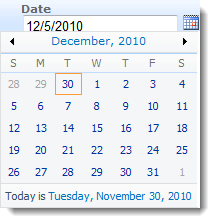 Date Picker– allows you to set filtering for a particular date using the familiar pop up calendar. Options for (All) and (Empty) Filters – allows you to control what you see when no filter is applied, and when there is no value in the field you are filtering on. Default Values including [Today] and [Me] – very useful for getting quickly to your most relevant stuff. We feel this has added useful new functionality to v1 and we have a long list of things we plan to put in v2. $1,395 for a 3 pack – ideal for farms, covering 3 web front end servers. and Site Licenses from $2,975 – covering your for unlimited SharePoint users and servers in one geographical location. FilterPoint will be available for purchase before Christmas – so register today for your 25% discount! We’re pretty excited about this product as we think web part connections and dynamic filtering are a great ‘hidden’ feature in SharePoint so we want to build up a library of examples of how you can use this – do you have any use cases you would like to share with us?